It's nearly here! My favourite festival in Phuket - the amazing vegetarian festival. If you are in Phuket between the 17th and 26th of this month, you'll have a chance to see something special. BUT here's a hint.. you will not find anything much going on near the main tourist beaches. No, this is a local event with a rich history going back almost 200 years, this is not a tourist show. Want to see something? You need to make a bit of effort. The festival is centered around Phuket Town and the many Chinese Shrines in Phuket that reflect the Chinese ancestry of many of the people here. Most of the shrines are in or near the town, with a few around other parts of the island. The main processions take place early morning around the town - if you want to catch one, best to stay in town, or you'll be needing an early morning ride from the beaches, as processions start around 7am. 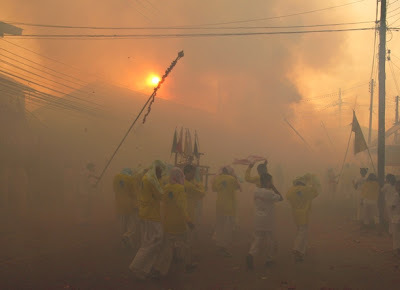 It all kicks off on Saturday 17th in the late afternoon when the "lantern pole" is raised at each temple down which the gods are said to descend. I'll be having a look at my nearest shrine in Kathu village a few km outside town. The street processions take place every morning from the 20th to 26th. There are events in the afternoons and evenings too and in town and areas around the shrines, food stalls galore selling the special food that is eaten during the festival. There are some stalls and restaurants doing this food at the beaches but not many. If you head into Phuket Town around the market area near the Jui Tui shrine, that would be a good place to sample the food. All shrines, starting around 5pm - raising of the lantern pole. Events at the shrines will go on all evening. The lanterns are hung from the pole at midnight, signifying the start of the festival. There will be plenty of firecrackers and fireworks too. Well worth a visit on Saturday evening. Not sure if I will be awake at midnight, but I will be at Kathu shrine for the pole raising ceremony. 18th - 19th October - no big events, but you can visit any shrine at any time, and now the food is available too. I will again try to stick to the special diet for the duration of the festival. Street procession starting 7am for Sapam Shrine - this shrine is a few km north of Phuket Town. Photographers and TV news always cover the first procession, as everyone wants to get the first photos for the paper, and local TV always covers the festival. Street procession for Sam Kong Shrine - it's not far from my house - see more here: Sam Kong Shrine. They will walk from the shrine in the north of town down through the old town. I might try to catch the start of this procession, but note that the street around Sam Kong shrine is very crowded and if you go with your own transport you may need to park some way from the shrine. Street procession for Ban Tha Rue shrine which is in the Thalang area of Phuket in the center of the island - this used to be the main town in Phuket a few hundred years ago and there are several historic temples in the area as well as a museum of Phuket history. In the evening the schedule shows "Oil bathing and bladed-ladder climbing" starting 7pm at Kathu shrine. Now, last year we went to see these events but they were not being held.. and a brochure I have from the Kathu municipality does not show these events in the schedule. A big day! Street procession in Phuket Town for the Bang Neow Shrine, which is in the south of the town on Phuket Road, one of the biggest shrines participating in the festival. There is also a procession for Cherng Talay Shrine in Thalang district. Street procession for Jui Tui shrine, which is the biggest one of all, found just west of the market in Phuket Town. Since Saturday is normally my day off I do believe I will be in town for this one! Later there are lots of events at various shrines including bladed ladder climbing at Sam Kong and Bang Neow shrines and something called "nail bridge crossing" at Sapam Shrine. Street procession from Kathu shrine to Phuket Town. It's a fair walk this one, about 5km from Kathu Shrine all the way to town, around the old town and ending at Sapan Hin. Kathu is my "local" shrine, I will aim to be at the shrine before 6am to witness the piercing rituals as I did last year. The procession then heads out of Kathu village around 6:30am. 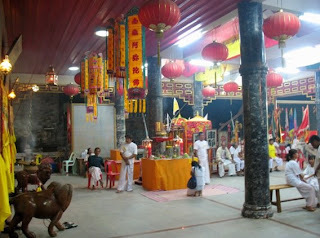 Later in the evening - fire walking at Bang Neow and Sam Kong shrines. The last day of the festival. A final morning procession for Sui Boon Tong shrine, then events such as firewalking at Kathu shrine at 3pm. Then, in the evening/night a big procession around Phuket Town, carrying statues of the gods to Sapan Hin. Lots of firecrackers and fireworks. Ends at midnight with the "farewell" to the gods. 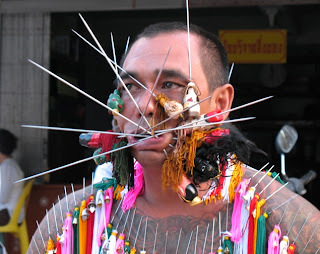 I do hope to summon up energy enough to be in Phuket Town in the night for this event - I have seen it on TV, looks mad! Around 5pm the lantern poles are lowered at the shrines marking the very end of the festival.